How Does Your Dog Spend Its Day? Meet Zeke Hayes, Zeke is one of our regular Dog Day Care Guests at Oxford Pet Resort & Spa. He loves to get into the drinking water bucket. Zeke is black lab and he is 2 years old and weighs 54 pounds, his sister is five years of age and her name is Chutzpah, she prefers the doggie pool! 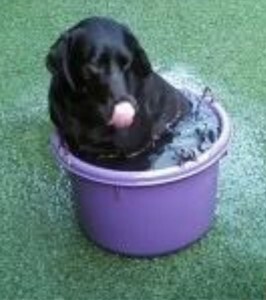 Why don’t you come and visit us and check out how much fun our daycare dogs have, I am sure Zeke will share the water with your pooch. Our Daycare Program, designed by Niki Tudge, limits the number of participants and matches dogs based on age, physical activity and personality traits. 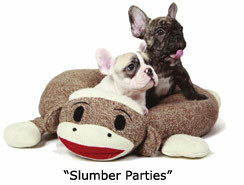 In addition, dogs less than 20 pounds have their own “Small Paws” daycare in a separate, specialized environment. Our resort dog playgroup sizes are a maximum of five to ensure we can effectively supervise your dog’s play and guarantee all dog interactions remain polite and stress free while giving them many opportunities to interact safely with their canine buddies. This entry was posted in Pet Care Articles & Tips and tagged dog day care, pet hotel, The DogSmith on November 7, 2011 by DogSmith. 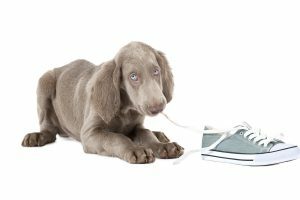 What is Canine Seperation Anxiety and How Is It Reinforced? Separation distress behaviors are those that occur as a result of diminished social contact with a person or a place. 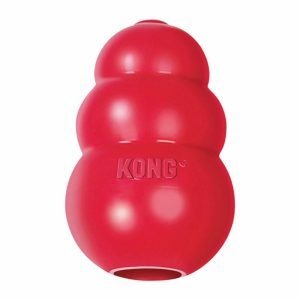 When a dog is left alone with diminished social contact it can be an aversive for the dog. The dog becomes conditioned to cues in the departure sequence and this can elicit panic related emotional responses which motivate the operant behaviors we observe such as pacing, chewing and scratching. The operant behaviors we observe as a result of this conditioned emotional response act to negatively reinforce the dog helping to minimize the aversive. If you have a dog that exhibits separation distress behaviors then contact your local DogSmith, there is hope and there are lots of things you can do to alleviate this distress and change you dogs behavior. This entry was posted in Canine Rescue Resources Program and tagged behavior change, seperation anxiety in dogs, seperation distress, The DogSmith on October 31, 2011 by DogSmith. 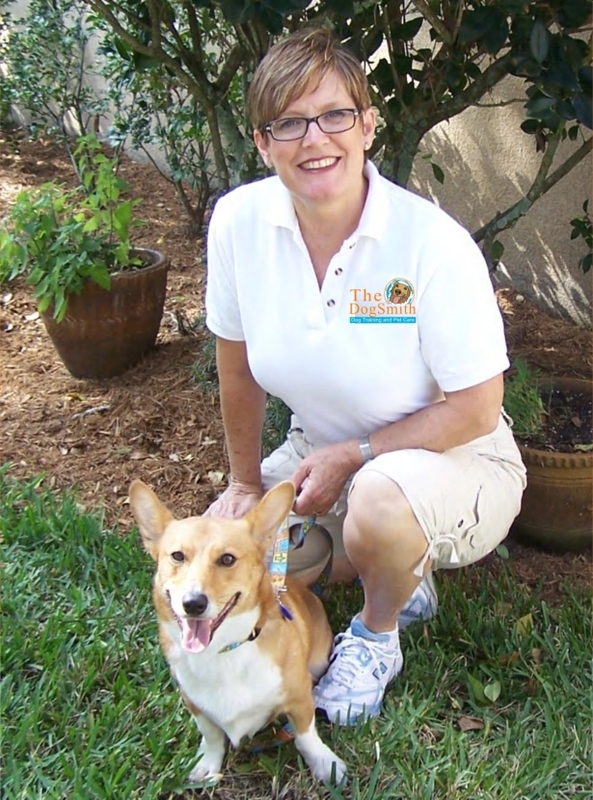 Despite the sluggish economy experienced by many Florida businesses, The DogSmith of Palm Beach County continues to grow and now offers dog training and pet care to neighboring areas. Jupiter, FL – To meet the growing demand for her dog training and pet care business, Rachel Williams, owner of The DogSmith of Palm Beach County, has announced her partnership with Susan Barton, Certified DogSmith Dog Trainer, to expand operations into Hobe Sound, Jensen Beach, Palm City, and Stuart Florida. The animal lovers in these cities will now have access to the same free DogSmith puppy socialization classes and canine rescue resource programs enjoyed by Palm Beach County residents. According to their mission statement, The DogSmith exists to enhance the lives of pets and their owners by improving their relationship and the quality of the life they share by providing professional support and training to Pet Dog owners, supporting and assisting animal shelters and rescue organizations to minimize the number of unwanted animals and offering affordable and professional care to family pets so that pet ownership is never a burden. This entry was posted in Company News & Views and tagged economy, Expands, industry, Jupiter FL, pet care, Susan barton, The DogSmith on February 14, 2011 by DogSmith. 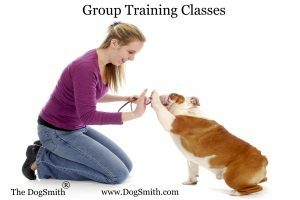 Why should I join The DogSmith Dog Training & Pet Care Franchise? There are literally dozens of reasons to join The DogSmith Dog Training & Pet Care Franchise. For starters, opening your own DogSmith dog training and pet care franchise allows you to capitalize on the leading Dog Training & Pet Care business model in the United States. If you’re looking for a national company providing a unique opportunity in a recession-resistant multi-billion dollar industry, then this is it. The DogSmith provides you with the perfect opportunity to abandon your cubicle and join other entrepreneurs doing what you love for a living. The DogSmith leadership team has over 40 years of business management experience committed to supporting you in pursuit of your goals. With The DogSmith you will be part of a dynamic team of professionals where you will learn not only to be a dog trainer and canine behavior counselor but you will also learn how to operate a comprehensive pet care business. As a DogSmith you will have access to the most progressive training methods, curriculums, behavior analysis tool kits, franchise library knowledge base and our ongoing education and support systems. Our franchise system also provides you with a proprietary marketing system, DogSmith Brand Standards manual, proprietary marketing collateral and assistance with sales, training and financial management. One of the most valuable aspects of joining The DogSmith is you will have access to our registered marks, logos, and tag lines. You will be provided with proprietary operational and business systems, methods, software and programs at shared costs which greatly reduce your overhead expenses while giving you leading edge technical advantages over your competition. Other key advantages to the DogSmith Franchise are that your franchise is scalable so you will never be limited to being just self-employed. By optimizing the opportunities for multiple income streams and leveraging the resources of your employees and contractors you become a true business owner. Finally, by joining The DogSmith you hit the ground running avoiding the expensive and frustrating “trial and error” period that most individual new businesses go through. From our strategic and tactical marketing plan to our startup pack containing everything you need to begin marketing your business from the ‘get go’, you greatly minimize the cost and time between opening and profitability. How much capital do I need to invest into a DogSmith Franchise? The initial and only cost is $38,000. This includes your Franchise fee, The DogSmith certification training and includes ongoing education and support via teleconferences, webinars & DogSmith webcasts. Furthermore we continue our support through our annual DogSmith conventions and onsite training workshops. The initial fee also includes your start-up pack which contains everything you need to get your business up and going. Your website pages, toll free number set up, email account and preferred vendor accounts are also included. Any additional investment depends on your personal situation and how you will be structuring your business. Many franchise systems will advertise their fee but you will soon discover that in addition to their initial fee you must also pay a training fee and other additional fees before you can launch your business. What background and experience do I need to be a successful DogSmith Franchise candidate? The DogSmith selects candidates based on their natural talents. We then train for skill and manage and support for quality. We are looking for individuals who enjoy working with people and animals, are reliable, ethical and have a strong drive to succeed. The ideal candidate will also be self motivated, organized, professional, and punctual with a passion for customer service. 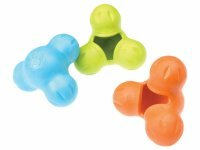 This entry was posted in Company News & Views and tagged Dog Training Franchise, pet business opportunity, The DogSmith on September 18, 2010 by DogSmith. WOW look how talented The DogSmith is in Palm Beach County Florida. A private dog training lesson. Who are the students? 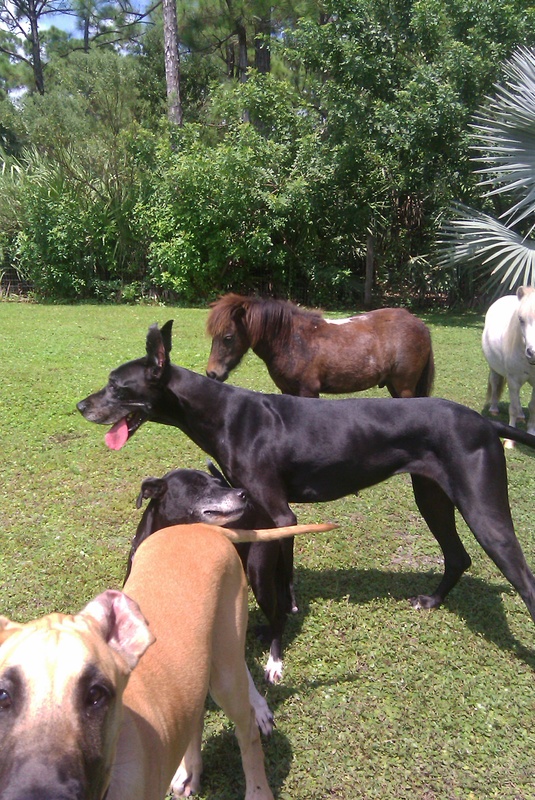 This entry was posted in Company News & Views and tagged dog training palm beach fl, florida dog trainers, The DogSmith, trainining dogs in florida on September 18, 2010 by DogSmith.